Here’s a short helpful video to watch before starting Luke. Attention musicians – 4 gorgeous classical works in this first chapter alone! It starts with an intro, and I wouldn’t ordinarily think significant, except that the name Theophilus jumped out at me. Who the heck is that? Well…. In Greek it means ‘friend of god’. So no one really knows if this was even a real person, or just a term of endearment for the intended audience. Wikipedia has a whole page discussing who he might have been. Right off you’ll notice that this book seems to be the ‘prequel’ – the angel Gabriel visits both Elizabeth and Mary to tell them they will have sons. But interestingly, although he tells Elizabeth that her baby will be filled with the Holy Spirit (v 15), he does not specify that the baby will be conceived by the Holy Spirit, as he does with Mary (v 35). So I guess Elizabeth became pregnant the old-fashioned way? Note the reference to Malachi 4:6 in v 17, and also the reference in v 32 to Jesus being an descendant of David – not possible if Joseph was not his biological father. 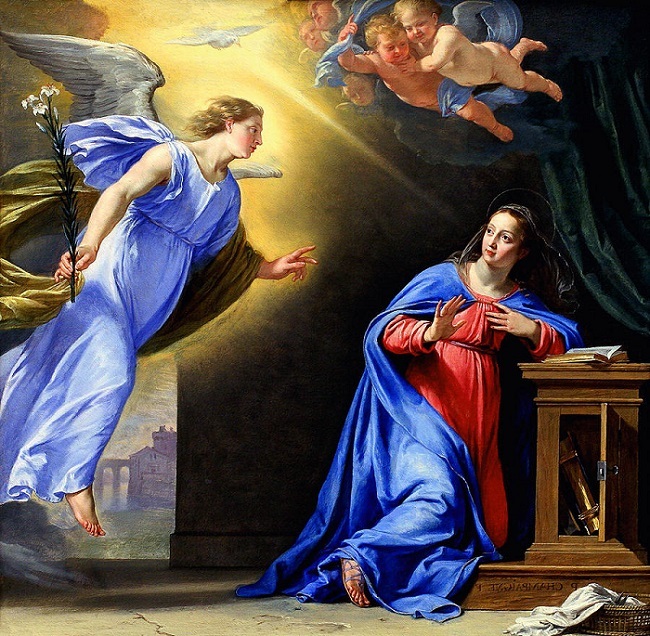 Gabriel’s words to Mary (v 28) became the first line of the prayer Ave Maria (Hail Mary). The second line of it was spoken by Elizabeth in v 42. (The last line, about praying for sinners, is not from the bible and was added in the 15th century.) Here, Placido Domingo sings the Bach-Gounod version. I’m puzzled by Elizabeth’s words in v 43. How does she know that Mary is the mother of her Lord? I went back and reread the previous verses; nowhere do I see where either woman was told about the significance of the other’s baby. Mary responds with the song known as the Magnificat, recited in church and set to music by dozens of composers. Contemporary British composer John Rutter’s version is my favorite. The story of John’s birth (v 57) just so sounds like a folk-tale to me. But Zechariah’s response in v 67 was a shocker. This little ditty is known as the Benedictus and is sung (often in plainsong or chant) in traditional churches regularly. I’ve recited it thousands of times from the Book of Common Prayer and never knew its origin or meaning. I didn’t even know it related to John the Baptist, although that’s obvious when it’s read in context, esp in v 76-77. Here is Ralph Vaughan William’s version.